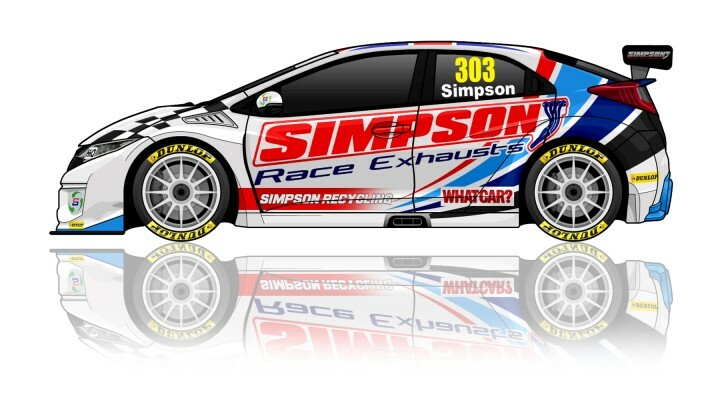 Matt Simpson enters the BTCC in 2016. The book tells the story of the Type R brand; cars made for those passionate about the thrill of driving. The book is available worldwide, the shipping costs are the same, 12 € for all countries (except France). Through his exceptional success story, we’ll discover the advent of the sportiest Honda cars; from the first NSX to the 2015 Civic Type R.
Below is an unfinished extract from the book. The book’s content will be dual language, English & French. I don’t have a publishing house working with me on this project as they’re not crazy enough! I’m doing this with small team.To understand the book to a degree where I would want to buy it, I knew I needed to be surrounded by people who are as passionate as I am. There are now thirteen people working on it! It’s been a risk to personally bear all of the operating costs (design, graphics, correction, translation, linguist & travel). With almost 18,000 Euros invested in the project so far, if I do not acquire enough orders to print the book, the team will be paid as agreed. The justification of the crowdfunding is to make sure the printing of the book happens. I have chosen to use a well known European printer (Escourbiac), who can offer the best type of materials to make sure the book has the quality feel it deserves. During discussions on the French forums, a final price of €45 Euros was agreed for European orders (excluding delivery). For us to achieve this price point, an initial order of 500 books would have to be placed. The book would not make the project a profit until around 950 orders have been placed. This project is something I care about deeply and therefore I propose to you (on Ulule only) that the price to acquire the book will have a special price of €39 (excluding delivery) for European orders. If the orders of the book exceed 1000 units, then instead of giving you back some Euro’s, I will be offering additional content, which will be obtained from a trip to Japan in the near future, and I promise you will not be disappointed. If the campaign is successful, and I truly hope it is, I will be offering a financial bonus to my team for all of the hard work that I have asked of them for the duration of this project. If it doesn’t work, I’ll offer you a new campaign with a lower goal but with a higher price. I am pleased to introduce to you my wonderful team. Lionel Lucas, 32 years old.In addition to my daily career as a civil engineer, I’ve also been a blogger the French website Caradisiac since 2006.With regards Type R’s, I think I loved them from the moment I knew they existed. When Honda stopped selling the Type R in Europe in 2010, I had the thought to begin writing this book, and to celebrate the planned return of the Type R brand to Europe, I started this project just over a year ago. I have to honest and say that this book provides a certain element of therapy for me. After many years of driving iconic cars such as Peugeot Rallye’s, Clio Cups and Civic Type R’s, I almost lost my licence, and realising that I had paid out more than €2500 euros in fines, I took a moment of reflection and purchased a hybrid car. I must admit that my behaviour during this period changed. I believe that we can take pleasure in driving on the road whilst being completely responsible. There is a time for everything. For me it is a matter of balance, self control and responsibility. The sheer thrill of driving is something that we must relish in those exceptional moments, and through the reading of this book, I really hope I can share this philosophy with you. Amongst the concepts and special editions at the Tokyo Auto Salon 2016, tuners have turned their attention to the new Civic Type R to give their unique twist on the race car for the road. The event is the world’s largest customised automobile show, with thousands attending to see radical versions of some of the best-selling cars in Japan and globally. Modulo have taken the standard Type R design, and added a revised body kit, with flared side skirts. The standard fuel filler cap has been replaced with one of a different design, while red body colour accents are used on the wing mirror covers and the sides of the rear spoiler. Honda Racing will exhibit a range of its challengers from 2015, including the McLaren-Honda MP4-30, the Super GT GT500 NSX CONCEPT-GT and Honda’s entry in the Japanese Super Formula series. Honda NSX Super GT Concept.